Irreversible and unexpected, heart failure is the leading cause of death in Western countries. For 50% of men who die from heart attacks, the fatal attack is their first symptom. Coronary artery disease (heart attack, or myocardial infarction) is the number one killer in the United States, yet it barely existed before 1900. A sampling of older cardiologists still working in the 1950s could not recall a case prior to 1910. Most people are unaware of this and do not readily believe it. It is not a highly publicized fact, possibly because it glaringly reminds us of the cause: the way we now live, principally the westernization of diet – the consumption of commercially processed foods. Some take a position that people were more active then, and we are more sedentary now. This is true, but should not be used as an excuse to continue eating what we prefer, instead of what we should. There is a general misconception that cardiovascular disease affects only men, leading women to believe that they are not at risk. Although it is more prevalent in men, it is not a gender-specific health problem. Between 40 and 59 years of age, as many as 1 in 12 women display clinical evidence of heart disease. This prevalence rises to 1 in 3 among women older than 65. The heart consists mainly of a special type of muscle known as myocardium. Just like every other muscle in the body, the heart requires its own steady supply of oxygen- and nutrient-rich blood. The heart is fed by its own circulation system, known as the main coronary arteries: the left anterior descending artery, the left circumflex artery, and the right coronary artery. If one these three arteries becomes blocked, the part of the heart that it serves becomes starved of oxygen, leading to a condition called 'cardiac ischemia'. If this oxygen starvation continues for too long then the affected heart tissue begins to die, leading to a heart attack – also known as 'myocardial infarction', which literally means 'death of heart muscle'. A blood clot (red mass) forms where an arterial plaque (light color) has ruptured. It may grow and block the artery completely. Most heart attacks are caused by coronary artery disease (atherosclerosis, or hardening of the arteries), in which the insides of the arteries become clogged with plaques consisting of cholesterol, calcium, and other substances. Each plaque has a soft inner fatty (lipid) core which contains a strong clotting agent, and a tough, fibrous outer shell that keeps the liquid core away from the blood. When one of these plaques ruptures and spills its contents into the bloodstream, a blood clot forms at the site of the rupture. If it grows large enough, it can block the flow of blood through a main coronary artery or a smaller branch artery and trigger a heart attack. Chronic inflammation of the artery walls can lead to heart attacks by increasing the buildup of plaques. Rarely, a heart attack can be triggered by a coronary artery spasm, in which an artery in the heart is temporarily constricted. Tobacco and drugs such as cocaine can cause these life-threatening spasms. A tear in a heart artery (spontaneous coronary artery dissection or SCAD) can cause a sudden heart attack, and is often the cause in those who otherwise have low risk factors, especially women aged 30 to 50. Exertion and excitement can trigger a heart attack in those at risk. Many other risk factors can be reduced once they have been tested for. Laboratory testing is now going far beyond total cholesterol (HDL and LDL ratios) and triglycerides. Anyone with an elevated risk of heart disease should do specific testing to assess their risk and make the necessary changes. Such tests include hs-CRP, lipoprotein(a), homocysteine and fibrinogen among others. Many who have experienced a heart attack describe the feeling as being "like an elephant was sitting on my chest", "a giant fist squeezing my heart", or "a squeezing sensation in my arms." The pain can be constant or intermittent, and usually lasts for 15 minutes up to several hours. It is not improved by rest or taking one's usual angina medication. However, not everyone experiences these classic signs, or even any symptoms at all. For some, an 'uncomfortable' sensation, achiness, pain or pressure in their neck, jaw or shoulders is the only sign of heart problems or a heart attack. More symptoms are listed below. Some heart attacks occur without any warning, but many people experience warning signs hours, days, weeks or even months in advance. One common sign to look for is episodes of chest pain caused by angina, which begins after exertion and is relieved by rest. Angina is similar to a heart attack in that blood flow to the heart is interrupted, but the difference is that blood flow is restored within minutes and heart tissue is not permanently damaged. About 1-in-4 heart attacks occur without any warning: episodes of interrupted of blood flow to the heart are pain-free, even when they are damaging heart tissue. This is known as 'silent ischemia', and is common in those with diabetes. Coronary artery bypass surgery, also known as heart bypass surgery, creates a new route ('bypass') for blood and oxygen to reach the heart. It is one of the most widely performed – and often unnecessary – surgeries in the United States. While the surgery does increase long-term survival of those with the most severe forms (left main coronary artery occlusion and three-vessel disease) and relieves symptoms in 85% of patients, the long-term results actually indicate a reduced survival rate for those with mild to moderate coronary artery disease and a return of symptoms within five years. Complications arising from coronary bypass operations are common, as this surgery represents one of the most technically difficult procedures in modern medicine. During coronary bypass surgery, the surgeon opens up the chest cavity by cutting the breastbone, then spreading the ribs to expose the heart. A healthy vein or artery from another part of the body (usually a leg) is connected (sutured) at one end to the blocked coronary artery and at the other end to the aorta or the internal mammary artery. In this way, the blocked portion of the coronary artery is bypassed, restoring full blood flow to the heart. One or more coronary arteries may be bypassed during a single operation. About 1-in-4 heart attack patients die before reaching the hospital, and many suffer serious and potentially fatal complications while confined. Those who survive the initial heart attack and feel well a few hours later are more likely to have a full recovery. 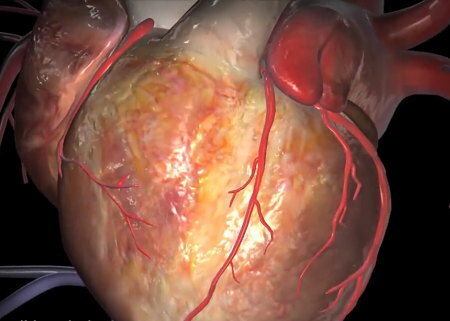 If part of the heart muscle has died, it is replaced by scar tissue over the next few weeks. If the heart is unable to pump enough blood to meet the body's needs, vital organs such as the kidneys or liver may be damaged. Most heart attacks occur over the course of several hours, so seek help immediately if you think a heart attack is starting. Elevated levels of serum uric acid increase the risk of heart attack. Heart rate is a stronger predictor of cardiovascular death in the elderly, particularly in men, than traditional risk factors such as diabetes and hypertension. Elderly men with a resting pulse rate above 80 beats per minute have a significantly higher rate of cardiovascular mortality. A low heart rate, below 64 beats per minute, is protective against cardiovascular mortality. Cardiac pain may occasionally present as upper abdominal pain. An acute myocardial infarction can cause upper-right or epigastric discomfort that may be similar to that of a gallbladder attack. Congestive heart failure may stretch the liver capsule. Cardiac pain may occasionally present as upper abdominal pain. An acute myocardial infarction can cause upper-right or epigastric discomfort that may be similar to that of a gallbladder attack. The pain caused by a Myocardial Infarction may extend downward into the abdominal area. In cases of heart disease, pain will usually be felt in the left or middle of the chest, but it can also be felt in the inner sides of the left arm, neck, jaw, or between the shoulder blades. Hiccups can be one of the first signs of heart muscle damage or heart attack. The presence of a diagonal earlobe crease has been recognized as a sign of cardiovascular disease since 1973. Over 30 subsequent studies have been reported in the medical literature, with the largest involving 1,000 unselected patients. The earlobe is richly supplied with blood, and a decrease in flow over an extended period of time is believed to result in collapse of the vascular bed, leading to a diagonal crease. It appears that individuals with an earlobe crease have a 55% greater risk of dying from heart disease than those without the marking, with the risk becoming even more significant if diagonal creases appear on both earlobes. However, this predictive value does not apply to Orientals, Native Americans, or persons born with certain hereditary disorders. Weight loss is a common finding among individuals with chronic heart failure. It is evident that malabsorption of fats is related to heart failure. In one study, subjects with heart disease had 10 times more fat in their stool than heart-healthy individuals. This means those with heart disease weren't absorbing their fats [Am J Cardiology 5: p.295, 1960]. Yet heart patients are typically placed on low-fat diets! These individuals were leaner, but not healthier. People who are highly anger-prone are nearly three times more likely to have heart attacks according to a study in the May 2, 2000 issue of Circulation. The study adds to previous research showing a link to heart health and other emotions, such as depression and hostility. Tired and heavy legs may indicate that the return blood flow from the legs to the heart is impaired. Gravity and impaired veins combined with possible heart problems result in oxygen-depletion in the legs, producing that heavy, tired feeling. Arm pain, usually in the left arm, can signal a heart attack or impending heart attack. In cases of heart disease, pain will usually be felt in the left or middle of the chest, but it can also be felt in the inner sides of the left arm, neck, jaw, or between the shoulder blades. This pain, also known as 'referred pain', should not be ignored. The pain that you experience is a manifestation of something going wrong in your body. An episode of angina is not a heart attack. The pain of angina means that some of the heart muscle is temporarily not getting enough blood. Angina does, however, mean that there is underlying coronary heart disease. Although patients with angina are at increased risk of heart attack, an episode of angina is not a signal that a heart attack is about to happen. When the pattern of angina changes (more frequent or longer-lasting episodes, or occurring without exercise), the risk of heart attack in subsequent days or weeks is much higher. Some studies show that people with gum disease are more likely have heart disease than those with healthy gums. In 2012, a scientific statement from the American Heart Association supported an association between heart disease and gum disease. Periodontitis is a serious gum infection that damages the gums and can destroy the jawbone. It can also lead to an increase in inflammation across the body; overactivity of inflammatory pathways is a strong risk factor for the development of atherosclerotic heart disease and heart attack. Hypoalbuminemia can be caused by certain heart conditions such as congestive heart failure or pericarditis that lead to low albumin levels in the blood. A buildup of plaque in the penile arteries can lead to difficulty achieving or maintaining erection. A long-running study of over 2,000 men found that erectile dysfunction is associated with a more than threefold higher risk of heart attack. Lead researcher Dr. Steven J. Jacobsen, a professor of epidemiology at the Mayo Clinic, reported the findings Nov. 11, 2003 at the American Heart Association's annual conference in Orlando, Florida. According to Jacobsen, "We can't say that it is cause-and-effect, but erectile dysfunction is a marker for future events of cardiovascular disease." Overall, men with a heart attack from 1979 to 1995 were 3.5 times more likely to have erectile dysfunction in 1996 than men who did not have a heart attack. Excessive yawning can be caused by a vasovagal reaction and may indicate a heart problem. April, 2017: A study involving 545 subjects and presented at the annual meeting of the European Association of Preventive Cardiology found that increased hair graying indicates a statistically significant increased risk of damaged arteries, arterial calcium deposits, and narrowing and hardening of the coronary arteries (coronary artery disease). In 1999 the Journal of the American Medical Association reported that the risk of death from a heart attack rose 24-fold in the first hour after cocaine use. Not everyone with heart disease gets peripheral vascular disease, and vice versa. For some reason, the process of atherosclerosis seems to affect different people in different places. However, if you have one, you are definitely at increased risk for the other. Male carriers of the common hemochromatosis gene mutation are at 2-fold risk of a first heart attack compared with noncarriers. Some 10% to 20% of the population carry at least one gene for hemochromatosis. Full-blown hemochromatosis affects about 0.5% and gene carriers usually do not know that they are at increased risk. They have almost no increase in iron stores over those without the mutation [Circulation: Journal of the American Heart Association September 21, 1999;100]. Certain risks to cardiovascular health begin around the time of menopause, and rapidly increase after menopause. Examples include changes in blood pressure and cholesterol levels, and a more sedentary lifestyle. Because it increases the risk for coronary artery disease by almost two times, a lack of exercise is nearly as dangerous to the heart as smoking, abnormal cholesterol levels, or hypertension. Sedentary living is the fourth major cardiac risk factor. A review of research evidence by US physicians published in the medical journal Mayo Clinic Proceedings in June of 2012 suggests that excess exercise (for example intensive training schedules or extreme endurance competitions) can cause dangerous long-term damage to the heart. According to this review, the safe upper limit for heart health is a maximum of one hour of strenuous exercise a day, after which we reach a point of diminishing returns. Since then, several studies have confirmed that the health benefits of exercise diminish for those who exercise excessively, for example among people who run more than 20 miles (32km) a week, more than six days a week, or faster than eight miles per hour (13kph). During prolonged, intense exercise the body burns sugar and fat for fuel which creates free radicals as a byproduct. Free radicals bind with cholesterol to create plaque buildup in the arteries which increases risk of developing heart disease. If you sleep less than six hours per night and have disturbed sleep you stand a 48% greater chance of developing or dying from heart disease. According to Dr. Emmanuel Stamatakis of University College London's Department of Epidemiology and Public Health, the risk of heart disease and premature death from any cause increases significantly for those spending more than fours hours a day watching television, surfing the web, or playing computer games. The study was published in the Journal of the American College of Cardiology in January of 2011 and involved 4,512 adults who were respondents of the 2003 Scottish Health Survey. It found a 48% increased risk of all-cause mortality and an approximately 125% increase in risk of cardiovascular events among those spending more than four hours a day in front of a screen, and also suggests that even two hours of screen time each day may place someone at greater risk for a cardiac event. The risk appears to be irrespective of factors such as smoking, hypertension, BMI, social class, and even exercise. Elevated homocysteine levels are believed to exacerbate oxidative injury to blood vessels and increase pro-clotting mechanisms linked to stroke and heart attack. There are a group of studies clearly indicating that elevated triglycerides combined with low HDL (two abnormalities known to be caused by high insulin) are much more predictive of cardiovascular disease than either elevated total cholesterol or elevated LDL levels. Swedish researchers reported in 2011 that having tonsils (or the appendix) removed before age 20 increases one's risk of suffering a heart attack at a young age – 44% increased risk for tonsils, and 33% for the appendix. Swedish researchers reported in 2011 that having the appendix (or tonsils) removed before age 20 increases one's risk of suffering a heart attack at a young age – 33% increased risk for the appendix, and 44% for tonsils. Even if you never become diabetic, high levels of insulin contribute to cardiovascular risk by increasing the process of atherosclerosis. 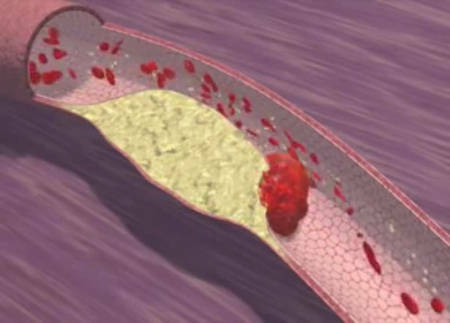 Insulin increases the rate at which cholesterol-laden plaque builds up on arterial walls. The abnormally high levels of insulin produced by all overweight individuals, diabetic or not, is an independent risk factor for early cardiac death. Being severely underweight can cause heart failure. Cardiovascular disease is the leading cause of diabetes-related death. People with diabetes are two to four times more likely to develop cardiovascular disease. At least 65% of people with diabetes die from heart disease or stroke. It is not clear yet if people with type 1.5 have the same high risk for cardiovascular problems as individuals with type 2. May 23, 2012: A study of approximately 24,000 people between the ages of 35 and 64 and published in the journal Heart found that participants who took regular calcium supplements were 86% more likely to have a heart attack than those who didn't take supplements. A November 2012 study published in the New England Journal of Medicine showed a 34% reduction in the risk of death associated with heart attack among patients who used aspirin daily. The B vitamins help prevent cardiovascular disease by reducing levels of homocysteine, which damages the arteries and promotes the buildup of plaque in the arteries (atherosclerosis). Researchers at Harvard University found that a high level of homocysteine in the blood more than triples the risk of heart attack. Extreme calorie restriction, which is common among yo-yo dieters, can increase levels of the stress hormone cortisol which, when present in the body over long periods of time, can increase one's risk of developing serious health problems such as heart disease, diabetes and even cancer. Risk increases each time the cycle of dieting and weight gain repeats. In another clinical trial, despite statistically significant weight loss reported in the Atkins group, every single cardiac risk factor measured worsened after a year on the Atkins Diet (measures included LDL, triglycerides, total cholesterol, HDL, total-to-HDL cholesterol ratio, homocysteine, Lp(a), and fibrinogen). While the LDL in the Atkins group increased 6%, the LDL cholesterol levels in the whole-foods vegetarian group was cut in half, dropping 52%. Men and women who ate legumes at least four times a week were found to have a 22% lower risk of coronary heart disease over 19 years than those who consumed legumes once weekly, researchers report in the November 26th issue of the Archives of Internal Medicine. The study was based on interviews and medical exams of more than 9,600 Americans who did not have heart disease when the study began. [Archives of Internal Medicine 2001;161: pp.2573-8]. Being overweight stresses our bodies and damages our health in many ways. Even those who are only slightly overweight have increased risk of heart disease and stroke. Having a lean body reduces the stress on the heart, lungs, and other internal organs. Thin people experience less heart disease and stroke risk. An Australian study of 230,000 subjects reported in 2016 that prolonged sleep – especially when combined with a sedentary lifestyle – increases risk of premature death from diseases such as heart disease, diabetes and cancer by up to 300%. In addition, sleeping too much may be an indicator of illness such as cardiovascular disease. An Australian study of 230,000 subjects reported in 2016 that prolonged sleep – especially when combined with a sedentary lifestyle – increases risk of premature death from diseases such as heart disease, diabetes and cancer by up to 300%. In addition, sleeping too much may be an indicator of illness such as cardiovascular disease. A mild heart attack may be mistaken for heartburn, and vice versa. See links between Increased Risk of Heart Attack and the treatments Lysine and Vitamin C.
Cysteine is sometimes used to help lessen the risk of coronary artery disease. Where heart disease is concerned, animal fats are generally considered unhealthy due to their association with high cholesterol levels in the blood. A Seventh Day Adventist study found that those who drank 5 glasses of water per day have on average half the cardiac mortality and half the fatal stroke rate of the general population. Research suggests that people who reduce salt in their diet by about 3gm per day can reduce their chances of developing cardiovascular disease by a quarter. Coffee, including decaf, contains significant amounts of Vitamin K which is an important factor for blood coagulation. People at high risk for blood clots, strokes, and heart attacks should avoid coffee and decaf for this reason. The use of monounsaturated oils such as olive oil may be more protective than a low fat diet. Use olive oil or coconut oil exclusively when frying. Avoid the use of hydrogenated fats (they contain trans-fatty acids) which may be worse than saturated fats in contributing to heart disease. If you are at risk of having a heart attack, taking one aspirin daily can greatly reduce this risk. A quarter of heart attacks occur within three hours of waking up, when the blood is thickest and stickiest and the circulation is at its slowest, increasing the risk of clot formation. Therefore, the most effective time to take aspirin for the prevention of heart attack, stroke and deep vein thrombosis is before sleeping. During a heart attack, it is important to get some aspirin into your bloodstream as quickly as possible by chewing 1 adult-strength or 2 to 4 low-dose aspirin. Most heart attacks occur when a cholesterol-laden plaque ruptures in a coronary artery, attracting platelets to its surface and causing a clot (thrombus) to build up. If the clot blocks the artery completely, it deprives part of the heart of oxygen and causes a heart attack. Aspirin helps by inhibiting platelets; only a tiny amount is needed to inhibit all the platelets in the bloodstream – in fact, small doses are better. This will slow clotting and decrease the size of the blood clot that is forming. After a heart attack, aspirin can help prevent further attacks when taken daily. An appropriate preventative dose is around half a regular aspirin tablet (150-160mg), or two baby aspirin tablets (81mg each). Research at the University of Oxford published in 2017 suggests that regular aspirin users without a history of heart attack or stroke should stop taking aspirin by their late 60s because after that age the risk of fatal bleeding probably outweighs the benefits. A further study, published in the New England Journal of Medicine in September 2018, confirmed no detectable benefit from regular use of low-dose aspirin for those 70 and older who are at low-to-moderate risk of heart disease; instead it found an increase in the rate of death in that population. Getting less than six hours' sleep each night doubles the chance of dying from a heart attack or stroke for those at risk. A landmark study in 1986 of 242 men aged 50-79 and based on 12 years of research stated that a small supplementation of DHEA corresponded to a 48% reduction in death from heart disease and a 36% reduction in death from any cause, other than accidents. Indirect evidence does suggest that DHEA supplements might reduce the risk of heart disease, especially in men, but this is far from proven. A Cardiovascular Disease Panel (Blood or Tissue Biopsy) can test for the presence of Chlamydia pneumoniae, Mycoplasma pneumoniae, Helicobacter pylori, Cytomegalovirus (CMV) and Human Herpes Virus 6 (HHV-6). Selenium is considered to be from 200 to 500 times more potent an antioxidant than Vitamin E. Selenium and Vitamin E are synergistic as antioxidants and inhibit or prevent the damage to tissues by free radicals which have been cited as causal factors in heart disease. Aside from CPR and dialing 911, there may be additional measures one can take when a heart attack occurs. Without help, a person whose heart stops beating properly and who begins to feel faint has only about 10 seconds left before losing consciousness. These victims can help themselves by coughing repeatedly and vigorously. A deep breath should be taken before each cough, and the cough must be deep and prolonged, as when producing sputum from deep inside the chest. A breath and a cough must be repeated about every two seconds, non-stop until help arrives or until the heart is felt to be beating normally again. Deep breaths get oxygen into the lungs and coughing movements squeeze the heart and keep the blood circulating. Some claim that biting or stimulating the tips of the little fingers (heart meridian) can provide needed stimulation at this critical time, and improve the prospects of recovery. People who live in a chronically stressed-out condition are more likely to take up smoking, frequently overeat, and be far less likely to exercise. All of these stress-related behaviors have a direct effect on the development of coronary artery disease. It is also known that the surge in adrenaline caused by severe emotional stress causes the blood to clot more readily (a major factor in heart attacks) and that the stress of performing difficult arithmetic problems can constrict the coronary arteries in such a way that blood flow to the heart muscle is reduced. Stress increases homocysteine levels, a known risk factor for coronary artery disease. Policosanol has other actions against heart disease in addition to lowering cholesterol. Like statin drugs, policosanol helps stop the formation of arterial lesions. One of policosanol's important actions is to inhibit the oxidation of LDL, which is the major contributor to arterial damage. Oxidized LDL promotes the destruction of blood vessels by creating a chronic inflammatory response. Many studies have shown that higher omega-3 fatty acid intake, through fish consumption or through supplementation, can cut the rate of sudden cardiac death by nearly 50% in both apparently healthy patients and those who have suffered a previous heart attack. Supplemental vitamin C can help heal injured arteries when used with L-lysine and proline for plaque prevention and possibly removal. A typical prescription would be 3-6gm vitamin C, 3-6gm lysine and 0.5-2gm proline. Furthermore, vitamin C deficiency (as indicated by low plasma ascorbate concentration) is a known risk factor for coronary heart disease. A Seventh Day Adventist study that was reported at the 2002 International Congress on Vegetarian Nutrition found those that ate a serving of nuts 5 times per week had half the cardiac mortality. Legumes contain low levels of sodium and high levels of potassium, calcium and magnesium – a combination that is associated with a reduced risk of heart disease. Folate, a mineral also found in abundance in legumes, is thought to reduce blood levels of homocysteine, a compound that can boost heart disease risk. A diet high in fruits appears protective against heart disease. The total number of deaths from cardiovascular disease was found to be significantly lower among men with high fruit consumption in one study. A large study of male healthcare professionals found that those men eating mostly a "prudent" diet (high in fruits, vegetables, legumes, whole grains, fish, and poultry) had a 30% lower risk of heart attacks compared to men who ate the fewest foods in the "prudent" category. A parallel study of female healthcare professionals showed a 15% reduction in cardiovascular risk when they ate a diet high in fruits and vegetables compared to the effect of a low fruit and vegetable diet. A high-fiber diet, particularly one that is high in water-soluble fiber (such as fruit), is associated with decreased risk of both fatal and nonfatal heart attacks, probably because presence of such fiber is known to lower cholesterol. Numerous studies have linked diets rich in fiber with low levels of cholesterol. In particular, soluble fiber alters and lowers fat and cholesterol absorption in the large bowel, helping to reduce LDL, the 'bad' cholesterol. Fiber-rich foods are also good sources of phytochemicals and anti-oxidants that help to lower the risk for heart disease. Blood pressure, a major heart disease risk factor, may also be reduced by eating diet rich in fiber, further helping to reduce the risk of heart disease. Making positive dietary changes immediately following a heart attack is likely to decrease one's chance of having a second heart attack. In one study, individuals began eating more vegetables and fruits, and substituted fish, nuts, and legumes for meat and eggs 24 to 48 hours after a heart attack. Six weeks later, the diet group had significantly fewer fatal and nonfatal heart attacks than a similar group that did not make these dietary changes. This trend continued for an additional six weeks. A sedentary lifestyle of physical inactivity is almost as great a risk factor for heart disease as smoking because of diminished circulation and weight gain. Research has shown that even moderate exercise can substantially reduce the incidence of coronary events. Aerobic exercise reduces cardiac risk by lowering LDL- and raising HDL-cholesterol levels, and by reducing blood pressure, body fat, blood sugar, mental stress, and blood clotting. Exercise also improves the heart's pumping ability, greatly enhancing the body's functional capacity and stamina. It is never too late to start. Healthy people who begin exercising after age 45 can reduce their death rate by 23%, and even patients who have already had heart attacks can use medically-supervised aerobic exercise to reduce their risk of another heart attack by up to 25%. One study showed a 30% to 35% reduction in ischemic heart disease risk in women with a high intake of supplemental calcium. Dietary calcium achieved no significant change in heart attack risk, the researchers noted. Getting the right amount of chromium each day may help protect against heart attacks in people that are at high risk, such as those who have diabetes. Chromium seems to improve levels of blood fats such as cholesterol.